I still have one blog post that I need to write before I can fully embrace this upcoming season. I need to formally say goodbye to Toni Lydman. When I first started attending Sabres games I was such a new fan that I had some trouble following the action. My enthusiasm for hockey far surpassed my experience actually watching hockey. 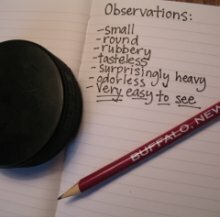 I was able to keep up with the basic game action (it’s not rocket science), but what I was trying to do was keep track of every little thing that every single Sabres did. 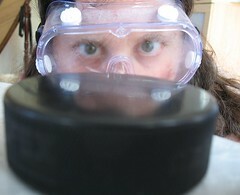 As a result, my earliest experiences with hockey were a jumble of confusion and minute details. It wasn’t at all unusual for me to miss exciting plays because I was distracted by watching one of the Sabres wiping down his face mask on the bench. My focus was all over the place. In the middle of all of this was Toni Lydman. For some reason, in the arena, Toni Lydman is like a beacon on the ice to me. I’m not kidding. In the middle of the chaos of an NHL game, Toni Lydman stands out as if he’s skating around under a spotlight. In the early days of my fandom it was like that scene in “West Side Story” when Tony and Maria first see each other at the dance and everything around them becomes blurry- except it wasn’t at all romantic, and as far as I’m aware, I do not hold the same magnetic attraction for Toni Lyman as he does for me. (Wouldn’t THAT be something?) I’m not particularly infatuated with Toni Lydman or his playing. He’s not someone I ever consciously tried to “see” out there. Lord knows he’s not flashy, but something about Toni Lydman just attracts my attention. In some ways, Toni Lydman became the player that I used to orient myself to the game. He was like a hockey landmark. “Okay, there’s Toni Lydman….so Tallinder must be up here on the right…” I know. It makes no sense. But there you go. My interest in Toni Lydman never became particularly sentimental, probably because he’s just not the type of player or personality you’re going to go all ga-ga over. To go ga-ga over Toni Lydman would be to disregard whatever you like about him in the first place. Toni Lydman is a player to be quietly appreciated, but never fussed over. I’m going to miss Toni Lydman. I’m going to miss thinking, “Hey, there’s Toni Lydman,” twenty times a game, I’m going to miss his (usually) reliable defense, and I’m going to miss his self-deprecating interviews. I’m curious to see if some other Sabre takes up the “Hey look at me, Katebits!” mantle now that Toni Lydman is gone, but I kind of doubt it. Toni Lydman might be a once-in-a-lifetime player. It’s possible that you never get another Toni Lydman. Good luck in Anaheim, Toni Tone Tony! Thanks for being so rad. Since you asked, I’ve had that sort of focus effect with a couple players over the years. 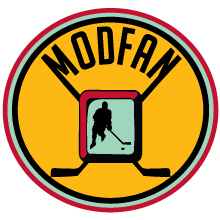 When I was first learning the game it was Alexander Mogilny. When I moved to NJ, Scott Stevens filled that role. For a short time while I was dating a Stars fan (I’m still jolted awake sometimes in the middle of the night by the awful, greasy feeling of being associated with Brett Hull!) it was Mike Robeiro. So if this were Lost, which it’s not, but anyway, Toni Lydman would be your constant. Yes, exactly Mike! And if this were “Inception” Toni Lydman would be my totem. I miss Lydman, too. I’m gonna miss his dry-as-sand interview style, and his wacky bursts of out-of-the-blue offense (he had two goals last season that were positively Ovi-like! ), and being able to get his attention just by yelling “SLAYER!! !”, but I gotta move on. On the other hand, he’s a Duck now and they have far less media obligations than, say, the Sabres might. Maybe I’ll be able to land an interview with him for my blog when he flies into town for the 12/21 game.